Situated about 25 kilometres west of Mombo, outside the Moremi Game Reserve on the Jao flats, Jacana Camp is a truly water-oriented camp and offers mokoro and walking safaris all year round. From about September to May, as the floodwaters recede, game drives and night drives in open 4 x 4 vehicles are available - depending on water levels. The camp is set in one of the most densely populated wetland areas for Sitatunga and Red Lechwe - but game concentrations depend on water flow and volume and change from season to season. 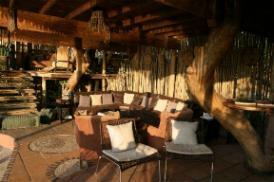 All the big game can be found in the area - Elephant, Lion, Leopard and Buffalo. Pels Fishing Owl is a favourite amongst birders, as well as greater and lesser Jacanas. 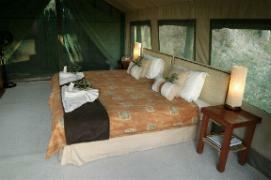 Jacana Camp has five meru-style tents. Each tent is built on a wooden deck overlooking the floodplains and has an en-suite bathroom with flush toilet and shower. The bathroom is enclosed, but roofless. The main dining area is on an elevated wooden deck between two magnificent sycamore fig trees and surrounded by dense wild date palms. Downstairs, there is a cosy pub and lounge, with an area to sit around an open fire under the stars. 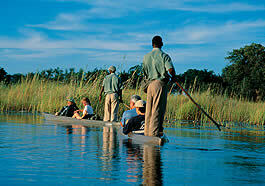 The camp is set in the most densely populated wetland area for Sitatunga antelope and Red Lechwe. Hippos and crocodiles are regularly sited. In the dry season lechwe, tsessebe, elephant, wildebeest and zebra occur here, and lions, cheetah and leopard are often sited on the floodplains. This is an area of prime importance for a host of wetland bird species, including Wattled Cranes, Pel's Fishing Owls, both species of Jacanas as well as other seldom sighted species such as Rails, Crakes and Moorhens.